During the winter months of the year driving can become more and more dangerous. Icy roads and now cause big challenges for drivers and what tyres you have on your car can have a big impact and how your car will handle in the winter. 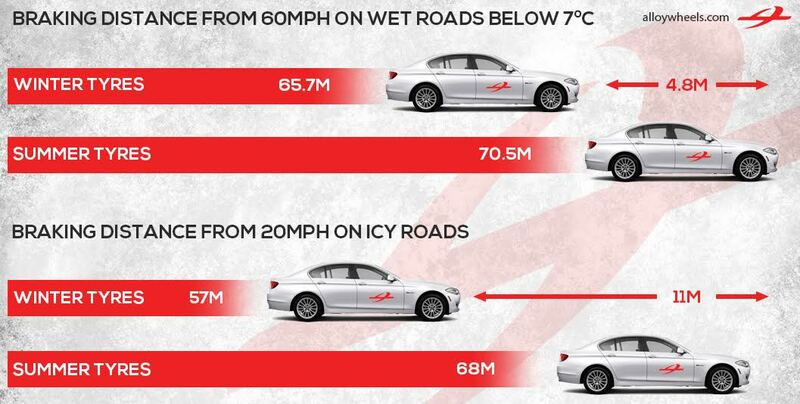 Winter Tyres or cold weather tyres are tyres designed specifically for these types of conditions. In many European countries it is law that you must have winter tyres fitted during the winter months, although this law has not yet reached the UK it does not make it irrelevant, and at alloywheels.com we strongly recommend to fit winter tyres to ensure your safety over the winter. What is different about winter tyres? The compound of winter tyres is different to that of summer tyres and contains more natural rubber so that it does not harden when it's cold. This ensures that the winter tyres stay flexible in low winter temperatures (below +7C) which helps to reduce the stopping distance and maintain excellent grip on snow and ice as well as on wet roads in cold conditions. The design of the tread on winter tyres allows the tread to bite in to snow and ice to give interlocking grip, which is critical in the centre of the tread where the tyre carries the highest load. The most common way to identify winter tyres is to check the sidewall as this will be marked with a symbol showing a snowflake. It is important to note that winter tyres are not suitable for all year round use – summer tyres will provide better performance when temperatures are higher and roads are dry. At alloywheels.com we usually recommend the biggest alloy wheel and tyre package that your vehicle can safely take to give the best look, however with a winter tyres package priorities change. Larger and wider tyres will tend to plow through the snow and ice whereas narrower tyre will perform much better and cut through much easier, giving a safer ride. Therefore when choosing your winter wheel and tyre package downsizing is a good idea to give your vehicle an even better chance in even the harshest of winter conditions. We also recommend a standard painted finish wheel rather than diamond cut or polished wheels, to ensure your wheels still look great when the spring rolls round. Be sure to use our winter alloy wheel and tyre search to find the best winter package for your vehicle.